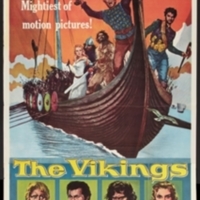 The 1958 film, The Vikings, is a “classic” cinematic representation of the Scandinavian settlers. The film takes place in the ninth century when Vikings sailed from Norway to Northumberland. They pillage the land, and, as the raid continued, they burned, thieved, and murdered. Among their atrocities, a Queen Enid is raped by King Ragnar of the Vikings, and her husband is killed. After the carnage, a new king is crowned; however, Enid is secretly pregnant with the child of Ragnar, the true heir to both thrones. Once he is born, he is sent to Italy, but the boat is seized en route; Eric, the child, is then captured and enslaved by the Vikings. When Eric is grown, Ragnar and his other son, Einar, plan to ruin the strongest English kingdom by stealing King Aella’s promised bride. Princess Morgana is taken by the Vikings and brought to Norway, but Eric spirits her away so that she may escape Einar’s aggressive advances. Eric is able to capture Ragnar in the process and delivers his whole crew to the English king. Aella throws Ragnar into a pit of wolves, but Eric shows him mercy; against the will of the king, he gives Ragnar a sword with which to enter Valhalla. The Vikings come to England with Eric seeking their revenge for the death of Ragnar. After the battle is over, Einar is killed by Eric over Morgana. The film was received fairly positively. It grossed 6.2 million against a budget of 3.5 million, making it a box office success. The film’s strong points, according to critics, were found in the set design and battle scenes. Historyonfilm.com complimented the final battle scene but criticized the plot holes and inaccuracies of the film, while Warped Perspective praised the epic battle scenes. According to John Aberth’s A Knight at the Movies, Vikings were almost always exclusively depicted as merciless marauders prior to the 1960s, in both film and in scholarship. Since then, scholarly views on them have changed, resulting in a more complex history of their motives and the scale of their raids. More emphasis is now placed on the peaceful aspects of the Vikings’ history, such as their trading and settlements. The film, however, follows a more traditional depiction of Vikings. Their leader in the movie, King Ragnar Lothbrok, may not have been a real historical figure but rather a literary composite. A Parisian monk recorded an invasion by Ragnar in the ninth century, so his actual existence is not really known. According to Ragnar Lothbrok’s Saga, Ragnar was killed in a snake pit at the hands of King Aella; the film portrays this but uses wolves instead. The legend holds that Ragnar’s sons did invade England to avenge their father’s death as they did in the film. The sons who avenged their father, however, are not the same sons as the ones depicted in the film. Ragnar did have a son named Eric and another named Agnar, who could be linked to the film’s Einar. However, Eric and Agnar are rarely mentioned by contemporary sources, probably because their sagas were only available in Scandinavia. There are no historical accounts of a Princess Morgana in the Viking world, and her character in the film seems to be drawn from Arthurian literature. In the film, the institution of slavery is represented by the characters of Eric and Sandpiper. Slaves had no legal rights in this time and were not permitted to own anything. They typically had to do the dirtier and more laborious work of the household. According to “The Viking Slave Trade: Entrepenuers or Heathen Slavers?” (published in History Ireland magazine) whether the slaves received an owner that treated them nicely or poorly was entirely a matter of luck. The film shows enslavement being fairly true to the period—that it was not based on race. The Vikings has both black and white actors for slave roles. Viking society was patriarchal. Women had a more domestic and passive role compared to men. According to contemporary sources, the day to day responsibilities of women included: food preparation and serving; housekeeping and laundry; child care; milking and dairy chores; and making clothes. Women do not have a major role in the film and do not seem to have much agency. In the film, we see the women as servants at the feasts while men drink and party. Morgana does not seem to exhibit much agency throughout the film. She is in an arranged marriage with Aella before being captured. As a captive she is not able to do much. However, she manages to prevent herself from being violated. The sage (or witch), Kitala, seems to be the woman with the most agency in the film. She manages to save Eric from drowning by calling on Odin to turn the tide. In the film, a woman accused of adultery is forced to stand trial by having axes thrown at her while crouching in a “testing board,” which is the film’s interpretation of the medieval ordeal. There is no historical evidence of Odin’s test. According to Norse texts, adultery was almost always impermissible for a woman, and according to some Viking law codes, if a husband caught his wife in the act of adultery, he could legally kill both her and her lover. Some Viking law codes contained punishments for husbands caught in the act of adultery as well, but some did not. The Vikings sticks to the roots of old Viking scholarship though it represents some aspects of this period’s social class and gender dynamics well. 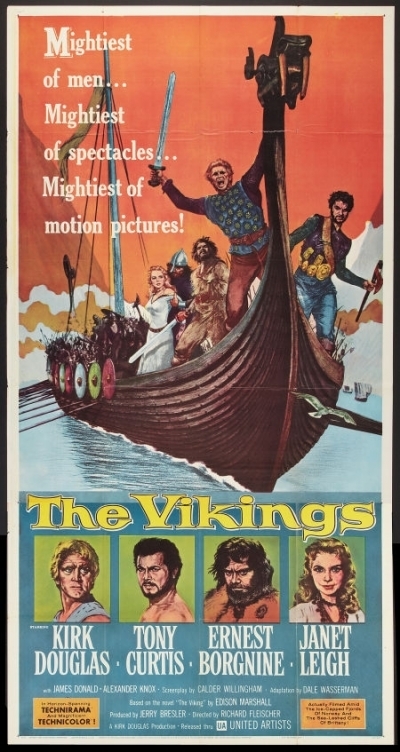 Saverio Giordano, “The Vikings (1958),” Medieval Hollywood, accessed April 21, 2019, http://medievalhollywood.ace.fordham.edu/items/show/178.